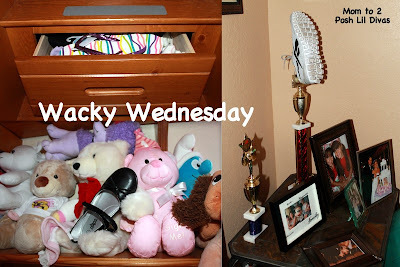 Have you read Wacky Wednesday by Dr. Seuss? If so, then you know how much fun it is to "spy" all the wacky things on each page with your kids. If not, GO! Get the book and read it, soon! My girls were in fits of laughter over the wacky silliness on each page. Seuss really knew how to get a child's attention. After reading the book, my Oldest Diva asked her sister, "What would you do if we woke up tomorrow and there was a shoe on our wall?" The Littlest Diva's reply - "Freak Out!" Amidst a good laugh by all three of us, I was inspired. 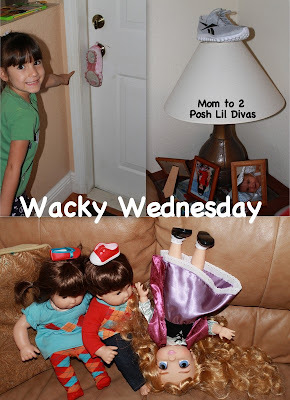 Yes indeed, the Lil Divas would wake up to a Wacky Wednesday of their very own. So, that is exactly what this Lil Diva Mom did and may I just say - I enjoyed every minute of it. 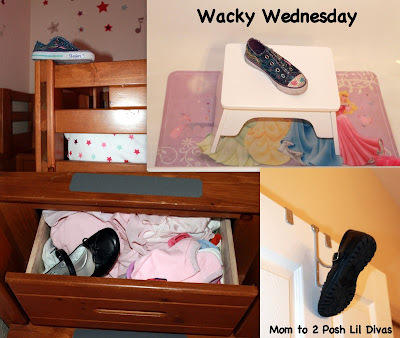 Inspired by the shoe on the wall, I put shoes all around the house - in unexpected places. There were shoes on beds, on doors, in the bathtub and in drawers. There were picture frames turned upside down and on their side, upside down dolls and dolls with shoes on their head instead of their feet. There were shoes on lamps and we even found a shoe on the front door! There were flip flops in the sock drawer, a shoe nestled with the stuffed toys and one of daddy's sneakers was even on display on a big trophy. The Littlest Diva was actually a bit sad when I admitted it was me behind all the wackiness (the Oldest Diva asked so I answered). I guess she liked thinking she had magical shoes. Ah, to be a kid again! This would be fun to do in the classroom too. At home you could get creative with your food - eat breakfast for dinner, make your milk a different color, etc. Esther it is a fun book! The girls really enjoying finding all the wacky things on each page. One of my favorite Dr. Seuss books, and I wish I'd thought of your activity! Very fun. Next Wednesday! OMG I had fun just reading. What a wacky fun idea . I have never heard of that book, but I must say it sounds like fun! Going to have to look for it at the library now! And what a fun day! Love it!